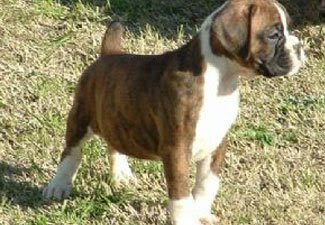 Breed Group: Working Weight: 63 cms Height: 32 kgs Color(s): fawn and brindle, both with or without white flashing and black mask Coat: The Boxer has a shorthaired coat, which is shiny, smooth, and fits tightly to the body. The coat comes in such colors as fawn, red, and brindle, with "flashings" of white on their underbelly, chest, and all four feet. Distinct feature: Boxers are lively, strong, and extremely loyal. They have an exceedingly high energy level. They carry themselves with pride, but are never arrogant. They have a stoic stance, and are intelligent, loving, delightful companions. Temperament: The Boxer is patient, dignified, and self-assured. They exhibit curiosity, but are wary of strangers. This breed is fearless and courageous if threatened. They are keenly alert and have a heightened sense of hearing, which make them excellent guard dogs. The Boxer adores children and other pets they have been raised with. They have an inordinate need for human companionship and do not like to be alone for extended periods of time. They are not well suited for a two career family. Activity: The Boxer enjoys regular play and outdoor exercise. They thrive on playing with their family and do best with a medium sized fenced yard. It is important to keep them stimulated and occupied indoors to prevent destruction brought about by boredom. The Boxer will do okay in an apartment if they are sufficiently and regularly exercised. I have a male boxer two years of age and healthy. I'm looking for a female boxer for mating. Let me know if anyone's interested.